How to add N working days to the current date in Java? Home Date Interview Questions Difficult Date Questions How to add N working days to the current date in Java? Write a program in Java that adds N working days to the current date and prints new date. There are 5 working days per week (Monday, Tuesday, Wednesday, Thursday, Friday). Here in a loop we are adding 1 to the current date and checking day of that date. If it is Sunday or Saturday then we are doing increment to the value of N because we are interested in working days. We need to do addition to current date using add() method of Calendar class that accepts DAY_OF_MONTH constant and number of days that you want to add. For getting day, we need to use DAY_OF_WEEK constant of Calendar class. How to convert Calendar to Date? How to find every information about given date? * @Problem How to add N working days to the current date? // Adding 1 day to calendar. * day so Increasing the limit to compensate working days. Output - How to add N working days to the current date in Java? How to add N working days to the given date in Java? Solution - This is very simple first of all Convert given String to Date and rest is same as above. Thank you friends, I hope you have clearly understood the solution of this problem. If you have any doubt, suggestion or query please feel free to comment below. You can also discuss this solution in our forum. 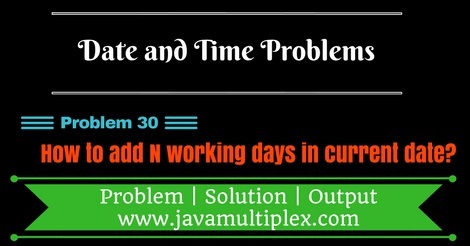 Tags : Date and Time problems, Addition of n working days in Java, Solution in Java, if else statement, for loop, Calendar. I am simple guy with lot of ambitions. My main motive is to share whatever knowledge I have related to programming. With me you can easily learn how to solve any programming problem in Java.You can connect with me on social networking sites also. Please provide your valuable comments. If you have any suggestion please share with me I will work on it and if you have any question or doubt please ask, don't hesitate. I am your friend, i will clarify all your doubts. How to find day before N years in Java? How to find day after N years in Java? How to convert ZonedDateTime to Date in Java? How to calculate age in year, month and days in Java? How to get day name of given date in Java? How to convert Date to ZonedDateTime in Java? Copyright 2016-2017 Javamultiplex All Rights Reserved.